Lynguglen/ myrtilli er ganske smuk, hvis man kan komme tæt på den. Som regel farer den afsted lavt over jorden. Her et eksemplar, der har fundet sig en fin plads i en Rynket Rose. Egentlig meget pænt, hvis ikke rosen truede med at ødelægge uglens biotop. The Beautiful Yellow Underwing is one of several small day flying moths that inhabit moors in Northern Europe. They are very fast flying so in order to capture them on your memory cards you have to search for them while they are feeding or at rest. Normally myrtilli is perfectly camouflaged on grass and heather but this specimen on Rosa ragusa was easy to spot. 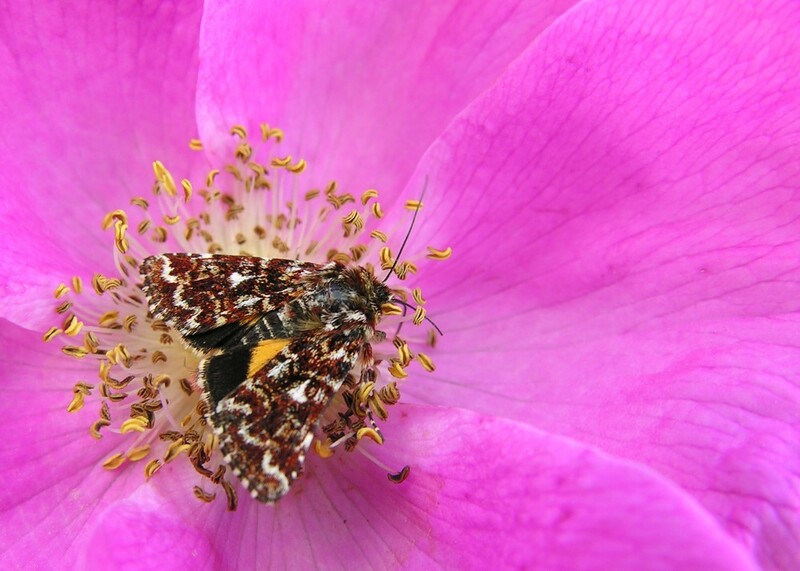 Let’s hope the rose is eradicated as it tends to ruin the biotopes of the moth.